When choosing your bead color, AB stands for Aurora Borealis. In 1956 Swarovski presented the jewelry stone Aurora Borealis, (know as AB) which shimmers in every imaginable color. When light hits this crystal, you not only see the color of the crystal but reflections of blue, yellow and pink. AB is a special treatment that creates the effect of producing these spectacular crystal beads. Extremely beautiful! 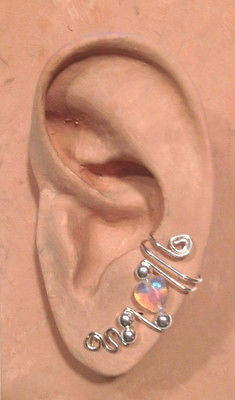 The first picture shows an Ear Ivy Half Cuff with Sterling Silver wire and beads and a Clear AB Glass Heart Bead. The second picture shows the same Ear Ivy worn with a ball stud earring. 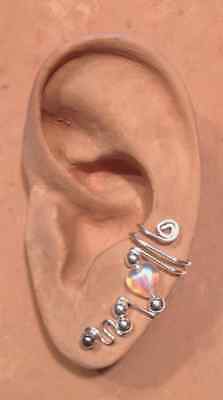 The earring stud is not included in the purchase price.